Requires Mine Little Pony mod to be installed for this mod to actually have a point. 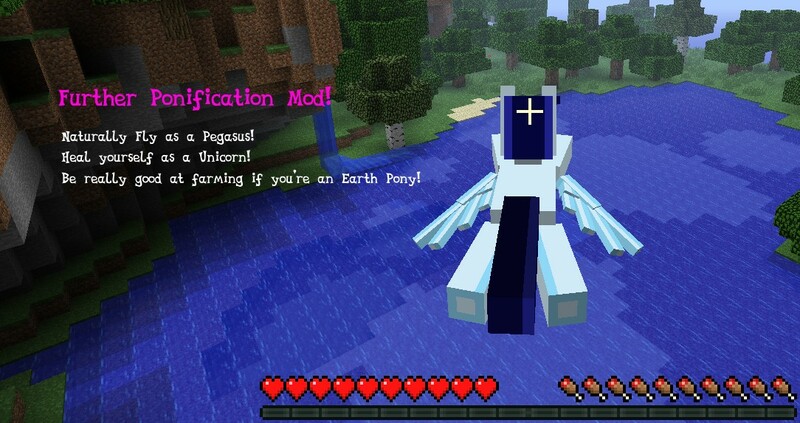 This mod/addon adds several features to single player Minecraft, such as the ability to fly in survival singleplayer if your character is a Pegasus, heal yourself or teleport yourself if you are a Unicorn, and get bonuses with farming and such if you're an Earth Pony. To set what pony you are, simply set it in the config file (which is at .minecraft/config/PP.cfg). This mod doesn't change how you look! That's Mine Little Pony, by Verdana, that changes how you look. Images are used here to emphasize the relative powers. 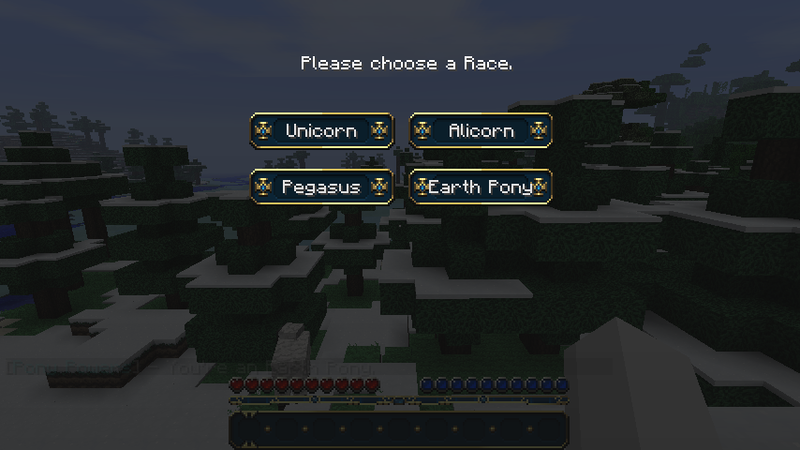 You can set it to Pegasus, Unicorn, Earth Pony, or Alicorn. Pegasus Flight works just like Creative flight - so there's no learning curve! But be careful - fly for too long and you'll get too exhausted to continue (and take fall damage)! Just double jump to fly. Left Shift and Space are the controls for down and up respectively. An altimeter will come up if you're flying above 70 meters high. Press P in-game (you can change this in Controls, if you like) with reduced health and you'll heal yourself! If you have more than 60% health, you will be teleported to wherever your crosshairs are aiming (if it's in range). (Still being worked on a little, but if it doesnt work, you can jump and push 'P' in mid air, and that should work.) Unicorns also have a small magic fire attack which will happen when they're attacking an entity. Earth Ponies get a HUD for lighting conditions and their current compass direction. Depending on the light level, certain icons will appear in the top right corner. As of version 1.0.0 for Minecraft 1.3.2, Earth Ponies also will, on occasion, set fire to their adversaries when hitting them! Note that this is temporary. 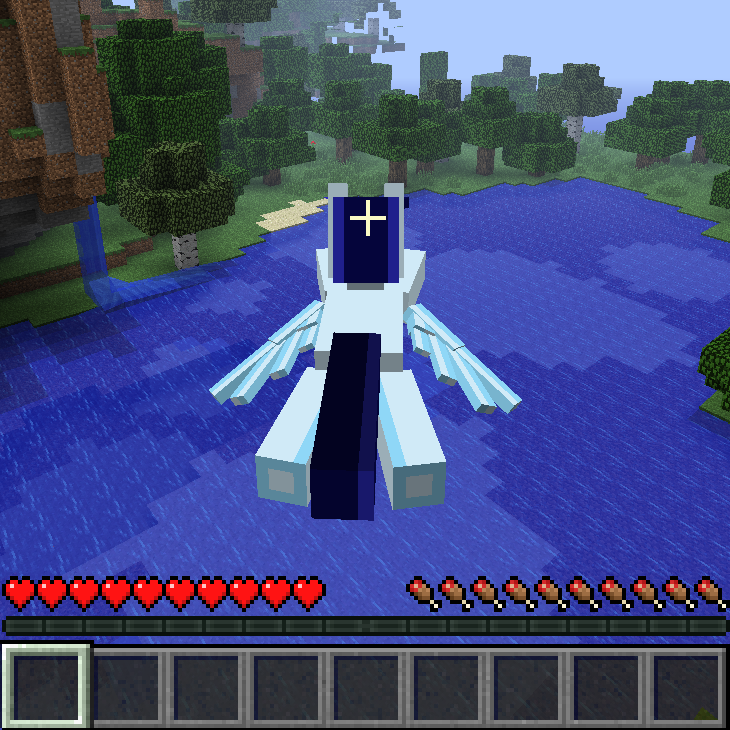 You will revert to your normal race on reload of minecraft, or if you click your race in the gui. 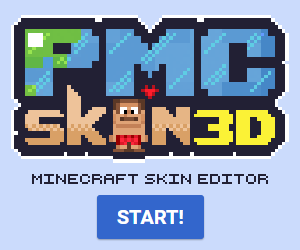 To make it permanent, simply change your race in the config file (.minecraft/config/PP.cfg). More abilities on the way! My Little Pony is copyright of Hasbro. I don't own it. Verdana made the Mine Little Pony mod, and the Mine Little Brony mod was made by myself. This is certainly not an official Hasbro/My Little Pony product. You do not have permission to copy and paste this thread and put it on your website, and you especially don't have permission to put this mod behind any sort of monetizing system. I made this mod with my own free time for no money, and to make people pay for this is dastardly. With Minecraft Forge installed, simply copy the downloaded zip file into your .minecraft/mods folder! That's it! Credit Verdana, All the fillies & gentlecolts on the Mine Little Brony and Pony Powers threads in mcforums. A minor update to 1.4.4/5. Question! Can this mod work on 1.12.2? Since you said it's compatible with everything? Please make update for 1.7.10 you don't have to change anything just make it compatible for 1.7.10 I BEG YOU! Is there a way to diable the mine little pony mod if you don't want it on at a surtian time? I have a recomendation for Earth Ponies. You break blocks Twice as fast as everyone else, and can pick up items over a larger range! It would fit with the architype! At the bottom of the mod's page it says: "Game Version: Minecraft 1.4." please update to 1.6.2 it looks AWESOME, but i can't make it work unless it's updated... *says with adorable face* pwease? plz make it 1.5.2 PLZ! whenever i put this mod into the minecraft.jar place and then load up the game, it loads up everything before the mojang screen part but then goes to a black screen of death. Am i doing something wrong? i have minecraft forge as well as mine little pony and my little brony mod installed as well, does the my little brony mod conflict with this mod? Please help because i love what this mod has to offer and i really want to be able to play with it installed. Thank you. PonyPowers is for Minecraft 1.4, not 1.5.2. You should add more ponies. have u ever maybe thought of combining this with the minelittlebrony mod? I've thought about it, yep. I'm not going to, though. ok would mine little pony work with the minelittlebrony mod installed? yes. they both do completely different things. as long as you're using the version of mine little pony that is for forge (it may be modloader), you'll be fine. teotoo can it be that this mod is not working for minecraft 1.4.7?? or is it not working with the mine little brony mod?? the mod is not 1.4.7 ready. will you update it even if mc is in 1.5 alrdey to 1.4. beacuse the servers i play on alow this mod but need to wait with the update?? I will probably update straight to 1.5 - I doubt the transition will be too taxing. did you got the mail i send you on plante minecraft?? yes i did - i'm fairly certain that that mod has been done before. I done the download instructions but it didnt work. Can you update this so that people using 1.4.7 can use this mod? 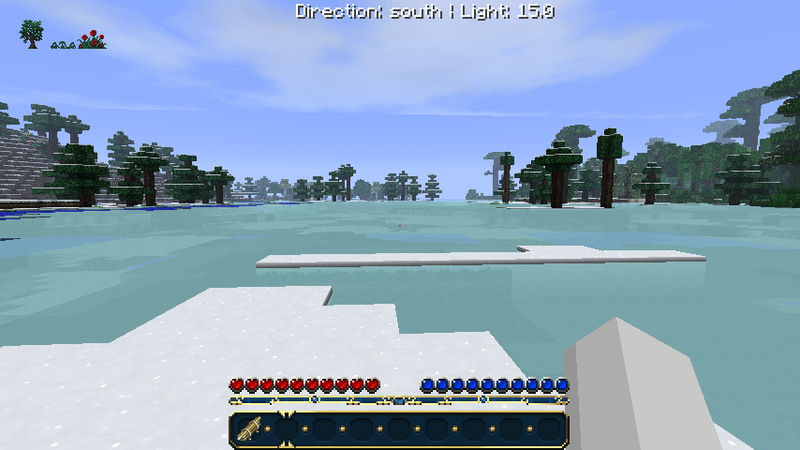 Because I use 1.4.7 and this mod doesn't work for Minecraft 1.4.7. There's a pre-release on the minecraftforum thread. So why haven't you, i don't know, put anything out yet? Its especially frustrating when people get to the thread and its not there. Because unfortunately, life is complicated, and I can't always mod. I wish I could, but unfortunately I cant. I hope to get a release out sometime soon though, but work is crazy. When I choose Alicorn or Unicorn my Character walk permantly... How can I fix it? a good idea would be to add, Chrysalis, Discord, Nightmare Moon, Gilda and other enemies. Earth ponies should be able to run faster then the other races as well as Buck apple trees to make them drop 1-4 apples or something. Seems like Earth ponies don't even get the short end of the stick. More like the stub of a stick. It would be really nice if people would read the thread before commenting. that's part of the my little pony mod. that's the one that makes you use magic to hold stuff. When did I say you can pick things up with magic? Yes it has been updated! Hey, can you make it so YOU DONT have to go into the config file? thanks! It doesn't say you can use modloader...because it says you need forge. You should right it compatible with mo`s creatures. and used teleportation as an alicorn. Just a few minutes later, the world went...weird. The biome I was in changed, and my character couldn't move. And it looked like he was toggling between crouching and standing super fast. Tried loading a different world and the same thing happened. Not sure if anyone else has had this happen or not. Any help would be appreciated. May have jumped the gun on that one. The glitch has stopped. Nope, Queen Chrysalis is not in this mod. Nameable Chests - Floaty Text Above Chests!